ZERO RH + is a technical race helmet and elegant and light, it consists of a inmold frame and a deep cup that fits over the head, an essential element as it comes to protection. Equipped with Fit-DoubleRH + Power system you can adjust the settings on multiple axes ansi have adjustment for you. • Comfort-fit: A multi-adjustable system that lets you fine-tune the circumference and height in three different positions to guarantee maximum comfort. Lightweight and easy to use. vel of added lightness and durability. The exclusive manufacturing process enables the thermoformed polycarbonate shell to be co-molded to the EPS line. • Lower ring protection: The co-molded polycarbonate guarantees enhanced mechanical strength in the event of impact. 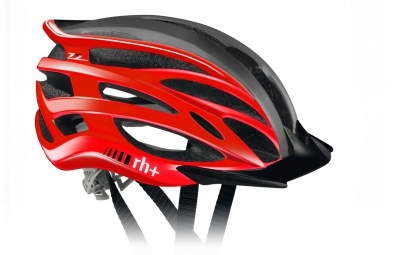 It makes the helmet less susceptible to the abrasions caused by wear and tear. • Divider: The lateral divider ensures rapid adjustment of the helmet’s fastening system. Put on the helmet, fasten the buckle and then just move the lateral divider up or down for your personal fit. • Stratosoft: The removable and washable padding is made from one piece of anallergic “rh+ fire dry” fabric with adding featuring a 3D open cell structure and ensures maximum comfort and wicks away sweat fast. • Reflex: Reflective stickers for maximum safety even in poor light. • In-moulding: Only “In-Mold & Injected Technology” gives helmets this level of added lightness and durability. The exclusive manufacturing process enables the thermoformed polycarbonate shell to be co-molded to the EPS line. Casque ZERO RH 2in1 rouge anthracite clasificado 4.3 de 5 por 10.